Arvind Gupta is one of those people every educator should know. Wonder why? Take a look. Gupta believes that children learn best by touching, feeling, cutting, sticking — pulling things apart, putting things together. And he’s devoted his career to providing children all over the work with the inspiration and tools to do so. And oh, by the way, creating his own brand of science education along the way. Gupta’s YouTube channel has a wonderful collection of “Toys from Trash” videos, with toys that demonstrate scientific principles. Here’s an example. His website includes directions, in multiple languages, for making hundreds of toys, complete with written directions and short videos. It can be the inspiration for hours of science instruction or a parent’s best rainy day friend. What young person couldn’t become entranced by a do-it-yourself treasure chest of new toys? Of course, Gupta is also a living example of flexible thinking, problem finding, and seeing new possibilities in everyday materials. His materials can also be used for teaching creativity. After viewing his website, everything around me is starting to look like a potential toy! 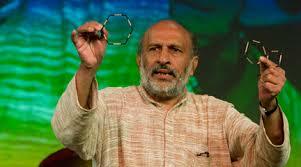 If you’d like to see more of Arvind Gupta, you may want to watch his TED talk. It’s a good one!